Brighton Kettlebells | Why margarine could be killing you! 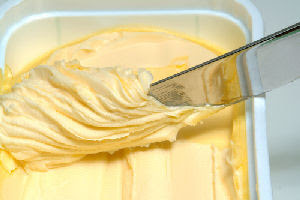 Why margarine could be killing you! It was a white substance with no food appeal so they added the yellow colouring and sold it to people to use in place of butter. How do you like it? They have come out with some clever new flavourings..
And here’s the most disturbing fact…… HERE IS THE PART THAT IS VERY INTERESTING! * it does not rot or smell differently because it has no nutritional value ; nothing will grow on it. Even those teeny weeny microorganisms will not a find a home to grow. Why? Because it is nearly plastic . Would you melt your Tupperw are and spread that on your toast? This entry was posted in Diet. Bookmark the permalink. Post a comment or leave a trackback: Trackback URL. Nice post, I'm going to add this to my blog nd sned it out to clients in my newsletter, nice stuff!